An irresistible new collection from the "New York Times" bestselling author and host of MSNBC's "Countdown with Keith Olbermann"
In his particular wit and style, Keith Olbermann skewers politicians, celebrities, and people behaving badly every weeknight on MSNBC's increasingly popular "Countdown with Keith Olbermann." 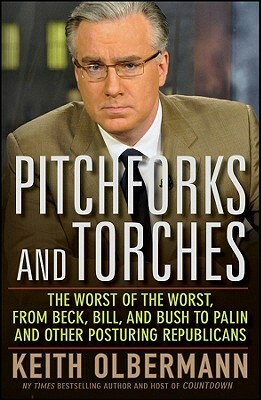 This book starts right after President Obama's election and collects all of Olbermann's acclaimed "Special Comments," a few of his "Quick Comments," all but one of his feature "WTF," selections of "Bushed" and "Still Bushed," and, of course, a healthy dose of "The Worst Person in the World." Covers everything from gay marriage to Sarah Palin and the Bush legacy--plus Sean Hannity, Glenn Beck, and, of course, Bill-OOlbermann is a frequent poster to the popular website DailyKos, where his audience has shown itself as fervid and highly supportiveNew from the "New York Times" bestselling author of "The Worst Person of the World" and "Truth and Consequences"
Showcasing Olbermann at his most controversial, outspoken, and entertaining, "Pitchforks and Torches" cuts to the truth in a world of lies.